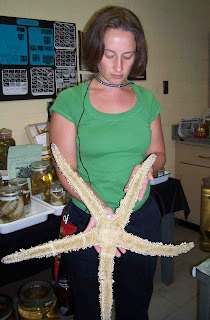 The Echinoblog: What Are the World's LARGEST Starfish?? The other day, I was thinking of BIG stuff. and then, a bit later, I was thinking of STARFISH stuff. 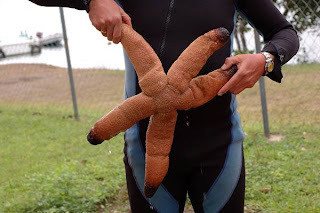 And then I thought What about a BIG Starfish POST??!! 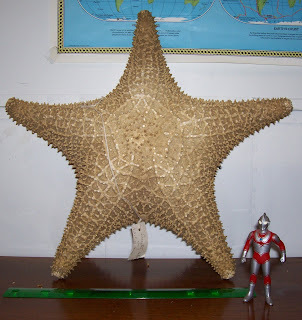 A survey of all the world's LARGEST starfish!!! Criteria: Different groups were evaluated primarily in terms of overall diameter and volume/mass. Some species, such as the brisingid Midgardia xandaros have REALLY long arm spans (4.5 feet!-to be discussed in a future blog!) but are just very minimal otherwise. 10. The Oreasteridae Fisher 1911 (Order Valvatida) Here is a WHOLE family of starfishes whose primary features include having heavily calcified, BIG oversized bodies. Three included species below are listed separately. 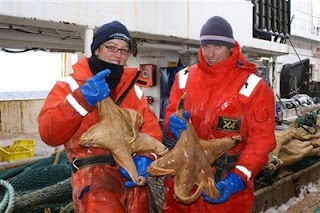 A big animal that lives in mud-soft-sediment in the Southern Ocean/Antarctica and has pointed tube feet. Adult size for Macroptychaster is about 1-2 feet (30-60 cm). The body cavity is frequently swollen making it appear even bigger than it already is! 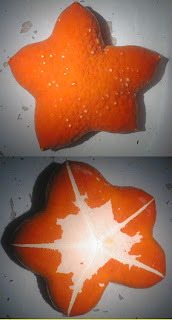 This species falls into the category "About which, little is known.."
A big oreasterid from the Indian Ocean. 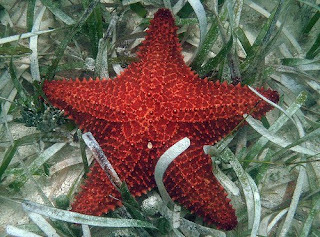 Lives mostly in tropical-shallow waters. All the adults I've seen are big, 1-2 feet across. This species also falls into the category "About which, little is known.."
6. Oreaster reticulatus (Linnaeus 1758) (Family Oreasteridae, Order Valvatida) Oreaster reticulatus lives in shall0w-water settings in the tropical Atlantic. Not as big as some, only about 1-2 feet across (a big one shown above), but these get THICK. Easily 6-9 inches thick along the disk! An animal that has been facing regional extinction due to an overzealous tourist trade. An increasing amount of information on this animal is becoming available..a microalgal film/scavenger/opportunist and sponge feeder with some foraging-feeding behavioral complexity. A blog on this animal awaits! 5. Astrosarkus idipii Mah 2003 (Family Oreasteridae, Order Valvatida) A weird beast I described back in 2003. This was first discovered by the Coral Reef Research Foundation during a coral sub-reef expedition (aka the Twilight Zone Expedition) back in 1997. This species occurs mostly in deeper water and is, found throughout the Indo-Pacific. Here is a big specimen collected years ago-with a human for scale. 4a. Acanthaster planci (Linnaeus 1758) (family Acanthasteridae, order Valvatida) A big starfish-and tied for 4th place, but sorry Wikipedia, NOT the second largest in the world. Typical sizes range in the 1-2 foot size range (30-60 cm) but with reports of some animals reaching slightly over 2 feet (70 cm). I've written about this infamous Indo-Pacific corallivore and will undoubtedly do so in the future! 3. Evasterias echinosoma Fisher 1926 (Family Asteriidae, Order Forcipulatida) I have only ever seen one or two specimens of this species of this size..but diameter is recorded at 37.79 inches (96 cm!) Making it over 3 FEET wide! This species occurs in Alaska and the Aleutians. Many are big..but not all are quite this large..
2. Pycnopodia helianthoides (Brandt 1835) (Family Asteriidae-Pycnopodiinae, Order Forcipulatida) A famously known species known only from the west coast of the North America. 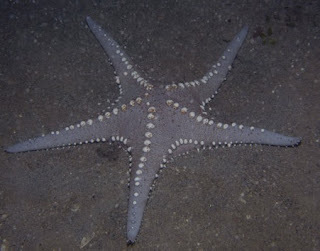 Under aquarium or ideal feeding conditions-this animal easily reaches 2 feet (or 80 cm) across but has been observed to surpass THREE feet in diameter. But thing is, its all mostly decalcified. Mostly fleshy tissue and soft stuff. Big volume and diameter but not much to its size out of water.. Pycnopodia is a voracious predator of uh..well almost everything. There's plenty known about it which is why I'll talk about it more during another blog post. Most people don't realize that one of the biggest, most massive starfish in the world lives in the South Pacific and Indian Ocean primarily in deeper water settings. It weighs in here at #1 because of its overall bulk, which reaches over 13.2 pounds (SIX kilograms!-yes, even I am skeptical) but reaches a maximum span of a little over 2 feet (60-65 cm). Hey! You didn't thank Ultraman for posing. You all seem to know what your talking about. 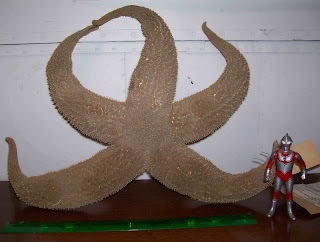 I have spent the evening trying to find what the worlds largest starfish is, and find a picture of it. No one on any of the search engines I've seen can agree at all. .. Thanks. Got another one for ya'll. 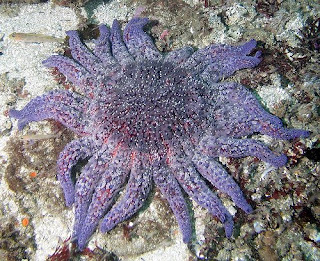 The largest starfish argument started with the question of how old do star fish get. I have a friend who runs a salt water retail store who believes that they live up to 30 yrs. 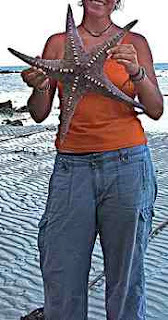 I figured that age and size went hand in hand, hence the search for the Largest star fish. 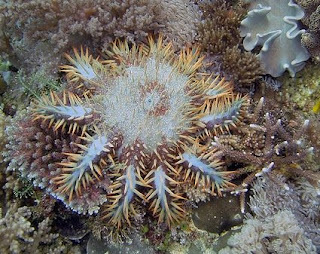 Is there a breed of starfish that will continue to grow indefinitely unless killed, similar to Coral? That's a great question. 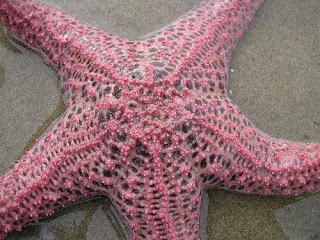 The truth is we have no data on the "natural" life span of starfish. Some professional aquarists I've spoken to have kept starfish for over 30 years and have made claims that they are VERY long-lived. They will often reabsorb body calcium if they don't eat and in artificial circumstances, some species just grow and grow with nothing to keep them in check. I don't want to make any wild claims, but it would'nt surprise me if they a 100+ year lifespan (or longer) were recorded someday... 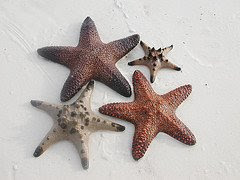 I've never actually seen starfish die of "natural causes"..so who knows? 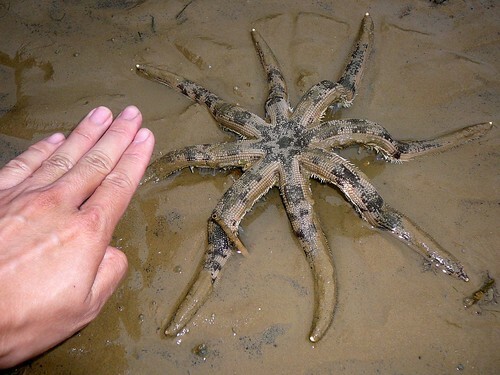 I live in Alaska and its just amazing how big the starfish get here do the number of arms have to do with the age at all? As a general rule, arm number doesn't increase with size . Some five or six armed stars can get quite large but don't add arms as a result of size. My fiance worked at the fiero marine life center in port angeles, washington for 7 years and we have personally seen sunflowers of over 3.5 feet and have heard of larger from other naturalists. And what about Midgardia xandaros, which is said to reach up to 4 feet ? the animals in this post are all actually large.